Over the past decades Otto Zern Lamps has acquired specialised handcrafting knowledge and the most diverse tools for producing lamps that are historically true-to-the-original. 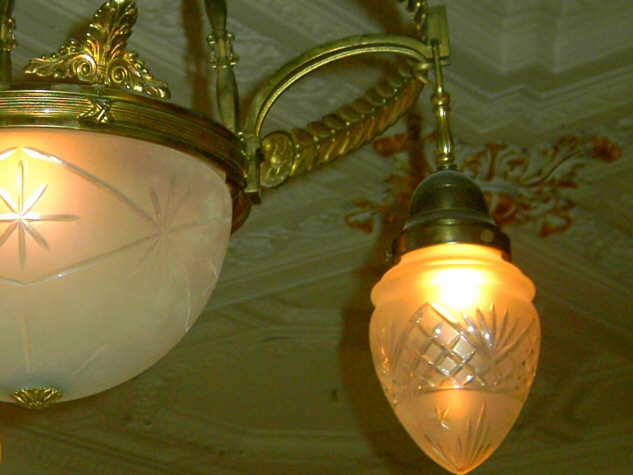 We also use our skill to restore original lamps and chandeliers from the various epochs of the various centuries. We restore Baroque style crystal chandeliers, Biedermeier chandeliers, candleholders from the Historism era, French Baroque, Late Biedermeier chandeliers, Rococo style lamps. Our restorations are true-to-the-original according to ancient handcrafting tradition and any missing parts are produced. On request we also issue expert appraisals, which are officially recognised. Chandeliers in need of repair are sometimes given to us in a very sorry state. The original surface can usually be restored using especially gentle methods. A contemporary electrification is usually needed in order to be able to ensure the chandelier’s safety. Our rich treasure of spare parts from various epochs also enables us to replace the missing glass. Our restorations are true-to-the-original according to ancient handcrafting tradition and any missing parts are produced. On request we also issue expert appraisals, which are officially recognised. Diese Website gibt es auch in deutsch.